The mission of the Florida Association of Rehabilitation Facilities, Inc. is to promote the interests of individuals with disabilities by acting as a public policy change agent, and to promote and serve the interests of community human service provider organizations. Florida ARF is a statewide, professional industry association that provides advocacy, information, and networking for individuals with disabilities and the community agencies that serve them. Florida ARF is a leader in the initiation of public policy change to promote and protect the interests of individuals with disabilities as well as the community agencies that provide quality services to individuals with disabilities. Florida ARF provides its members with factual and timely information, making its membership the best-informed and most effective influencers of systems change in their respective communities. The Florida Association of Rehabilitation Facilities, Inc. (Florida ARF) is a 501 (c)(3) public education institution and trade association founded in 1969 and incorporated in 1976 as a nonprofit corporation. The purpose of the Association is to promote the ideals and goals of human service provider organizations that provide quality services to individuals with physical, mental, emotional, or social support needs. Florida ARF is the only state professional entity that advocates for all people with disabilities through the continued development of community-based human service provider organizations. From very modest beginnings, the Association has broadened its membership base to encompass virtually every type of community rehabilitation organization. Florida ARF members include United Cerebral Palsy affiliates, Association for Retarded Citizens chapters, Goodwill Industries, and many of the state’s independent developmental and vocational community-based rehabilitation centers. The membership is diverse in size and service models but all have one mission in common - to provide quality services for individuals with disabilities. Florida ARF member agencies provide a full spectrum of services to support the various needs of individuals with disabilities including employment, community-based supports, residential, therapies, and educational services. Additionally, the Association administers multi-million dollar programs annually that result in employment of thousands of individuals with disabilities and houses a cadre of professionals providing a variety of services to its members and the industry. The Association maintains its state office in Tallahassee and conducts operations throughout the State of Florida. We are a member driven organization, meaning that the public policy that we influence represents the needs and philosophies of our member agencies and the individuals they serve. Florida ARF provides exceptional advocacy, information sharing, and networking services for its member agencies and has a rich heritage that has significantly shaped Florida's current human services systems. From the development of the annual legislative platform to reaching consensus on numerous public policy issues, the membership works cooperatively to promote policy decisions that are in the best interest of individuals with disabilities. Florida ARF members know that public policy based on the best interests of individuals with disabilities is also the policy that is in the best interest of community agencies. Florida ARF's governing body is a 18-member Board of Directors which is elected by the membership at large and is representative of its member organizations. From the Board of Directors the membership elects its officers who serve as the Executive Committee. Two seats are additionally designated for parents of individuals with disabilities. The Association’s business is conducted during quarterly meetings at various central locations across the state. Although numerous organizations and groups advocate for consumers and their families, Florida ARF is the only statewide association that represents the CEO’s business, management, and administrative interests in the rehabilitation arena, in addition to the interests of consumers and families our member organizations serve. Florida ARF works collaboratively with other state associations and organizations, while advancing its own mission and goals. Many Florida ARF members are pioneers in the disability field and are nationally and internationally recognized for their contributions. Others are new to the field and bring a fresh perspective. All exude enthusiasm and a depth of caring. Under the service mark RESPECT of Florida, Florida ARF is the designated Central Nonprofit Agency (CNA) operating Florida’s state use program. 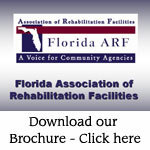 Since the program’s inception in 1974, Florida ARF has been the designated the Central Nonprofit Agency. Under this program, state agencies and political subdivisions are required to purchase certain products and services produced by community rehabilitation organizations that employ Floridians with disabilities in their production. RESPECT of Florida is supported entirely by the central nonprofit fees generated from the sale of products and services. Currently over 1,300 people with disabilities are employed by approximately 50 employment centers as a result of state, county, and municipal government purchases of RESPECT products and services. Florida ARF member agencies and RESPECT of Florida centers represent more than 100 human service entities that provide services to more than 10,000 individuals with disabilities each year.